Good communication with colleagues and clients is an important aspect of doing business successfully. But if you're only talking to your associates, you're missing out on half the story and leaving money on the table. 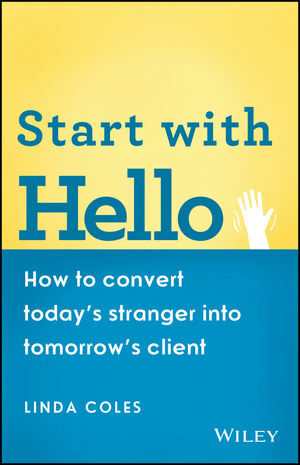 Start with "Hello" reveals how the most successful businesspeople and leaders share an overlooked and underappreciated talent—the ability to engage and communicate with strangers in productive, creative ways. Put simply, people like to do business with people they know, like, and trust. So get to know more people! Even if you don't think of yourself as the most outgoing person, you can learn to be more open and engaging to strangers. The book explains simple, key aspects of communication that make it easy to connect with new people, including behavioral styles, body language, and eye contact. Add together simple tips for starting conversations and following-up on them, and you'll be well on your way to making the business connections that count. In a small, hyper-connected world, today's stranger might be tomorrow's client. If you want to boost your business prospects in simple, practical ways, Start with "Hello" is the resource for you. Linda Coles is the founder of Blue Banana, which trains businesspeople in the use of social media in online branding and business development. As a consultant, Linda has spoken to a wide range of companies and organisations. She is also the author of Learn Marketing with Social Media in 7 Days. Visit www.bluebanana20.com.